To store a secure backup, you will need to access the engineering menu of the AVR or Maestro. Once you select the “Store secure backup” a pop up window will show up like the above picture, select “Enter PIN”. The default password is “0000”. 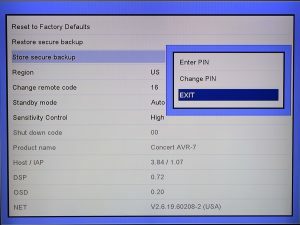 It should auto-populate so it is just a matter of pressing the “OK” button on the remote to store the backup. A message will appear stating storing the backup is successful and you are done! I want to control your Director amplifier via IP control, what port do I use? How can I connect headphones to my AVR or Pre-Processor while still having audio play thru the main speakers?